We had a very extensive backyard makeover done by Millennium. It turned out to be one of the best experiences we could ever have with a construction company. They were by far the most professional company we have ever worked with. I have nothing but praise for Millennium. The crew was always on time, cleaned up every day and was very respectful and always had our very best interest at heart. Our finished product is "Amazing". Don't look any further.....This is the company to hire. Eddie and his team completely revamped our backyard in Costa Mesa. From demolition, to building back up (pool, retaining walls, pool/spa, landscaping...) everything was great. The project came out on budget and per the initial design. We really enjoyed working with Millennium! We highly recommend them! After receiving 5 bids to remodel our backyard we decided on Eddie Guerrero from Millennium Construction, Buildingdreamsoc.com. Their design team captured our dream and made it possible. The workers were respectful, cleaned up the job site every evening and did an excellent job. We ran into a few hiccups here and there but worked through the issues and we have a beautiful backyard and our friends, neighbors and family love coming to our home. I am happy to refer the Millennium Team. Eddie and his team at Millennium are awesome. I've posted several photos of the outdoor kitchen he built for us under the captions J&K's Outdoor Kitchen. My photo skills don't do the work justice -- Milllennium did a great job. The job took about six weeks (as predicted), and every step of the way, it was clear that Eddie's top priority was making sure we were happy. If something wasn't perfect, they took it apart and did it again. Above and beyond at every turn. Millennium is not the cheapest out there, but they are worth it. 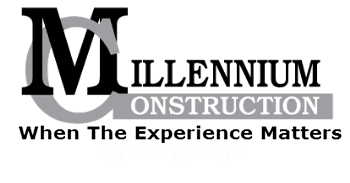 I am not someone who writes reviews on work done for me (I'm sure like most people), but I Feel compelled to write a review on Millennium Construction. My wife discovered that small amounts of water had leeched into a bedroom wall from an outside leak. We have had leaks from rain before and have had other construction and/or plumbing companies attempt to fix the problem but, to no avail. We contacted Millennium and the company's CEO, Mr. Eddie Guerrero, inspected the site and immediately determined the problem. To make a long story short, Millennium fixed the problem, and we were so impressed with their professionalism and expertise, that we had more work done to beautify our backyard. Wow! They did a fantastic job. We couldn't be happier. We are thrilled that we have a backyard we can show off and is so functional. All the different crews (for the different aspects of the construction) where always on time and the site foreman always kept us informed as to each step they would be taking. They Were always responsive to any questions or concerns we may have had during the construction process. Again, my wife and I couldn't be happier. I would highly recommend this company to anyone needing serious work done. It is so gratifying to know there is a professional construction company you truly can depend upon when needed. They are the "real deal". Millennium Construction is awesome. If you want the WOW factor Hire Eddie and his crew.They transformed our old back yard that we hated to spend any time in, into an expanded outdoor living space and can easily entertain 20+ people in the back yard. Before (6) was a crowd.We can gather at the Island while cooking, eating, etc. and watching our favorite sports. Sink with Hot & Cold water, disposal, Frig, etc.,,,.While in the center Patio that opens as desired, watching a different TV event and gathering around the Fire Table or very comfortable at the Fire Pit.All the work is at the highest quality and standards. They put in all the appropriated drains,hose bibs, electrical outlets, plants, drip irrigation, landscape lighting, TV(s), Sound System for Music,,, etc,,, . We now spend most of our time in our backyard.Thanks to Millennium and their crew. We are extremely happy, as well as all of our Guests . Excellent work done. I highly recommend Millennium. After obtaining multiple bids for our front yard remodel, we chose Millennium because of their commitment to their work and the design layout that they proposed. We were thoroughly impressed by each and every crew member and the cleanliness and organization during the extensive front yard remodel. They designed a beautiful large patio and amazing fire pit. Turning our unusable sloped area into an entertainers dream. Their concrete work in itself is one to brag about. Even after the work was completed they continued to check back to ensure that we were happy and fix any items that might need attention to. We would recommend Millennium to anyone wanting an amazing yard remodel with a trustworthy team "within budget". Thank you Millennium! You truly are Building Dreams in the OC! A company should be judged by its consistency of service. It appears that my husband and I experienced that SAME consistency of service by the Millennium Team at all levels during our patio construction project equal to what we had read in these reviews. I agree that this company employs a hard working and clean working team of laborers that are skillful and courteous. We are thrilled with our new patio, fire pit and hot tub. Our landscaping, lighting, and irrigation all turned out as we had dreamed it would. It truly feels magical at night relaxing in our back patio now. With all that being said, a company should also be judged by how it deals with and corrects any errors or snags in the implementation of the job. Millennium gets an A+ for handling the implementation of the corrections and for reassuring us along the way that everything will be done the RIGHT way. I've now used Millennium on two separate projects on different residences. The first was a backyard upgrade and the second was a complete and extensive interior re-model. Eddie and his team are exceptional professionals who I would highly recommend. They're able to provide strong design ideas based upon their many years of experience. Work is done in a timely and professional manner. We have always felt as if he and his team care about the end result and immediately address anything that doesn't meet their and your high standards.